I wonder if Horton-Tucker can stop the run? #KUbball pulls within 3 (40-37) and AFH comes alive... Big possession here. Garrett and Dotson forced the tie up and #KUbball had the arrow. Kansas ball. *With some help from Marcus Garrett. Bad post entry pass leads to ISU getting the last look. It was miss, but the follow was close. Won't count. But what an athletic play by Haliburton at the buzzer. Wow. #KUbball trails Iowa State 42-37 at the break. This one was 36-32, Iowa State, during the first meeting in Ames. Bill Self told Holly Rowe on the broadcast that #KUbball has to change how it guards ISU's ball screens. He did not, of course, explain how he plans to do that. Big Jay is currently dancing with the viking. It's either the best thing I've ever seen or the worst thing I've ever seen. #kubball back on the court. ISU hasn't come out yet. Rumor is they refuse to go back to Ames after seeing how much better it is outside of there. Ochai Agbaji starts the 2nd half in place of Grimes... #Kubball down 5. ISU starts with the ball. Vick has been short on pretty much every miss. That was Lawson's 5th ofensive rebound. Horton-Tucker uses his elbow and forearm to create space. Dotson, Garrett, Vick, Ochai and Lawson out there right now... The only one who consistently does it and looks natural while talking like a leader is Ochai. Incredible. #KUbball trails 47-39, 16:13 to play. Timeout KU. 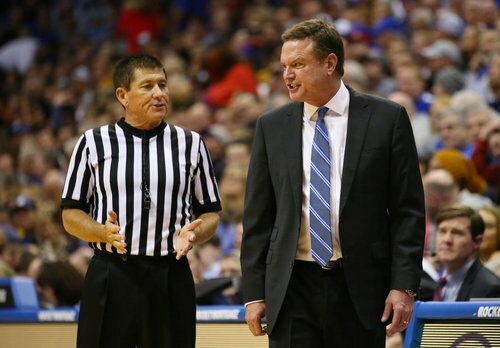 #KUBBALL with multiple chances to start a run, but they have missed on those chances. ISU takes advantage and pushes their lead to 8. 1-for-5 start to the 2nd half for KU and Cyclone lead 47-39. #KUbball 16:13 left in 2nd half, following this Self timeout. Grimes and Vick are a combined 1-11 tonight. 0-5 from three. Ochai's 4th foul seemed to go over super well with the fans. Most think it should have been offensive. Dedric Lawson's up to 22 points and 13 rebounds... 7 of them on the offensive end. Without that/him, this one would be over. #KUbball trails 50-47 with 13:01 to play. ISU ball out of the timeout. It seems like #KUbball has been outplayed and out-executed all game yet here we are, tied at 53 with 10:50 to go... Wild stuff.